Throw this album on the home stereo and let it caress you into the holiday spirit! 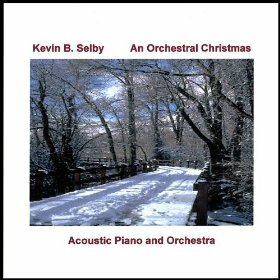 40 minutes (10 tracks) of beautifully orchestrated traditional Christmas hymns performed with acoustic piano and various orchestral instruments such as cello, strings, english horn, oboe, and others. This hymn really starts it all off. The Old Testament of the Bible promises a future Saviour of the world that would come to this Earth. Jesus was that Saviour and was born in Bethlehem long ago just as prophecy foretold. At this point in earth’s history, we are awaiting His second coming, so in a way, this hymn has a dual meaning and a double blessing. This song is meant to be happy and playful and therefore I arranged it that way. I just love the sound of happy flutes whistling away at the melody and harmony. My hope is that this track puts a pep in your step all through the holiday season! I meant for this track to sound like a lullaby, gently, lovingly telling us the story of the little Baby born in Bethlehem (in a feeding trough, no less!). What incredible condescension that God Himself, the Creator of the universe, would come into this world as one of us. This track is dedicated to little Dennis Winden, pounding on his drum for Jesus. This song really spoke to my friend’s heart when he was a child. I originally arranged it with quite a military bent, however, once my family and I went through the review process, we realized that the original arrangement didn’t really fit with the overall sound and rhythm of what we were trying to achieve with this album. I therefore created another arrangement that was more majestic and not so regimented. I hope I captured your fervor and dedication Dennis! I first heard this song while producing the Christmas album of my vocal coach Marsh Hudson. He sings it beautifully and I decided that some day I would HAVE to do an arrangement of it. I hope I captured the solemn and reverent beauty of this gorgeous hymn. I have always loved this hymn. While in college (and a little rambunctious musically!) I arranged a jazz version of this hymn and butchered it in a way. I’m glad I was able to capture the solemnity and gravity of the fact that three foreign kings read of the prophecies in the Old Testament and decided to come see this King that was talked about. Meanwhile, all the Jewish leaders and supposedly “religious” people in Jerusalem totally missed the birth of Jesus. God uses the foolish things of this world to put to shame the wise. This song gives me the mental image of a caravan of camels plodding along through the desert. Don’t ask me why it does this…it just does. Right in the middle of recording this album, the United States suffered an incredible terrorist attack that left many of us in shock and disbelief. I remember working in my studio that adjoins the downstairs living room. My peripheral vision kept seeing the T.V. which showed the various images of the attack, the rescue workers and the view of absolute destruction that was the aftermath of this horrible event. The happier part in the middle is when President Bush came to the World Trade Center site to encourage the workers. The piece ends on the sad modality indicating that we will never forget this tragedy. My main goal with the first 4 albums was to produce high quality solo acoustic piano works that would stand on their own and provide a good base to start from. Once I had them produced, it was time to focus on another Christmas album, this time using various orchestral instruments by way of SoundFont technology. In early September, 2001, I developed a track list of 10 to 12 songs. Originally, O Holy Night was on the list as well as several Christmas carols made popular by Julie Andrews (The Bells of Christmas, Irish Carol, I Saw Three Ships, and others). As the weeks passed, however, I had to make some tough decisions because certain songs weren’t falling together. Plus I had just spent some time at the Winden’s home where Dennis mentioned how much he LOVED the song Little Drummer Boy as a child. Well, when a friend gives you a cue like that, you simply MUST take it on. Similar to Acoustic Hymns Vol. 1, I gave my parents a rough CD of the tracks and had them review them and provide comments. I came back home with quite a list of details to check, fix, or change. These comments, as well as ones from my dear wife Kathy, enabled me to produce this album at the high quality that I believe it has. I gave all the tracks one final listen for several days going to and from work and made some final tweaks. Then it was time to upload them and finalize the album cover and inside liner notes (my favorite part of the whole production process, believe it or not!). I hope this album blesses your holiday season! This entire CD was produced using a SoundBlaster Live Platinum 5.1 sound card and Cakewalk Express 8.0 with the GP1 Grand Piano Soundfont by Alan Cheung as well as other orchestral Soundfonts from EMU. I then recorded .wav files of each track using Cool Edit 2000 and the Auditorium 1 reverb within the Platinum.